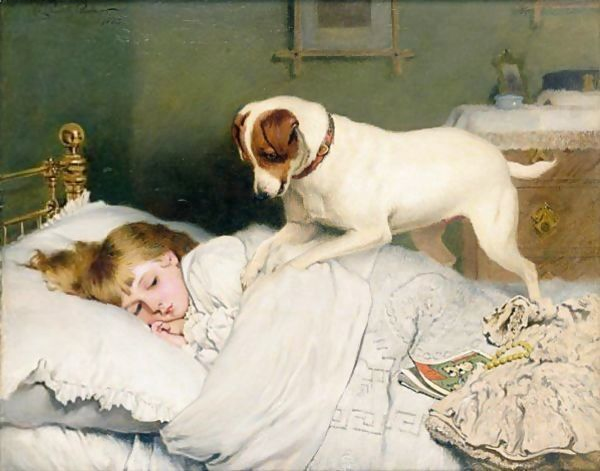 If you are a fan of Charles Burton Barber (1845-1897) and his charming paintings that often feature children and their pets, you might recognize the little girl and the dog in Time to Wake Up. Suspense shows same the little girl and dog with a small kitten waiting for breakfast. Though the room is colored slightly differently, both scenes occur in a bed with a brass bed frame. In the other painting, the little Jack Russell was patient in hopeful anticipation of sharing the little girl’s breakfast. However, in Time to Wake Up, the little dog is clearly unwilling to wait a moment longer for his mistress to get out of bed. Many of our pets have similarly jumped on our beds and done their best to get us up. This little girl does not appear ready to greet the day despite the eager entreaties of her dog. Time to Wake Up was painted by Barber in 1883. It is an oil on canvas that measures 24 x 30 inches. As with so many of Barber’s charming works, he adds little details that while not necessary to tell the story, add realism and charm to the work. In this case, it’s a book about sheep and a strand of yellow beads semi-hidden under a dress. We also see elements of Victorian England in the lace-trimmed pillowcases, the dress and a lace doily on the dresser. Perhaps a bit of late-night reading led to the little miss being less than enthusiastic about greeting a new day. Doesn’t the dog look like he will begin tearing the covers off of her any second? Look at that slightly open mouth. Betcha he’s getting ready to up the ante with a burst of barking too. Barber was known for painting realistic animals. Trendy painters of the time often added human-like features to their animal paintings. Barber keeps the animals real and yet provides great insight into what they might be feeling and thinking. At a Christie’s auction New York in 1998, Time to Wake Up sold for $365,500; a price $65,500 more than the original estimate. Who painted Time to Wake Up? We have more examples of Charles Burton Barber art and a biography to learn more about his life and painting style. He painted the pets of his own family, pets who remain anonymous and those of Queen Victoria and her children.